What advice would you like to give to young artists? Look at these spiritual and religious teaching. READ Morrison. Use storytelling. I always teach storytelling because we tell stories that help to navigate our lives and our processes of understanding meaning. When you really surrender in storytelling, you become open. We need to just remember that we are all telling stories and sharing them. We have to finds ways to process and embody these stories. People live and people die. I have to remember this when I am weighed down by the tragedy. To read this entire powerful interview, go here. 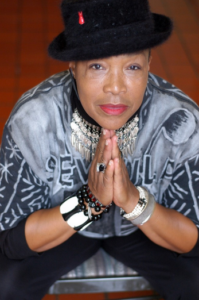 Performer, teacher, director Rhodessa Jones is Co-Artistic Director of San Francisco’s performance company Cultural Odyssey. Jones directs The Medea Project: Theater for Incarcerated Women, an award-winning performance workshop committed to incarcerated women’s personal and social transformation, now in it’s 23rd year.